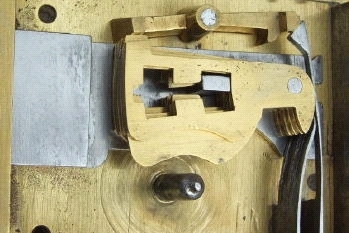 Turner's early 1840s locks were rather primitive, like this simple three-lever version below, Number 10566. It was also fitted with a see-saw detector in the style of Chubb's patent that operates when the detector lever is over-lifted. 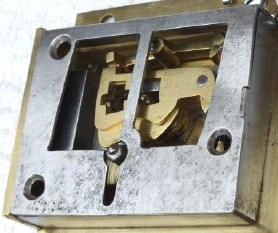 Its lower right hand projection is forced down into a notch at the bolt top end, and then held fast by the spring that leans onto that end of the detector.